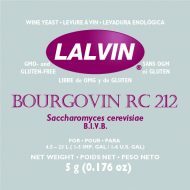 The Lalvin Bourgovin RC212 yeast has been selected by the BIVB (Bureau Interprofessionnel des Vins de Bourgogne), and was developed for red wines with color and structure. Due to the limited polyphenol adsorption on its cell wall, this yeast promotes the stabilization of the color and tannins during fermentation. This outstanding property makes Lalvin Bourgovin RC212 a wise choice to enhance the polyphenolic content of Gamay, Zinfandel and Grenache. Lalvin Bourgovin RC212 consistently produces Pinot Noirs with good structure, ripe berry, bright fruit and spicy characteristics. Rehydrate RC212 in 5 times its weight of clean water at 40°C. Let stand for at least 20 minutes then gently stir occasionally to break up any clumps. Add to the must. – The rehydration in must is not advisable.